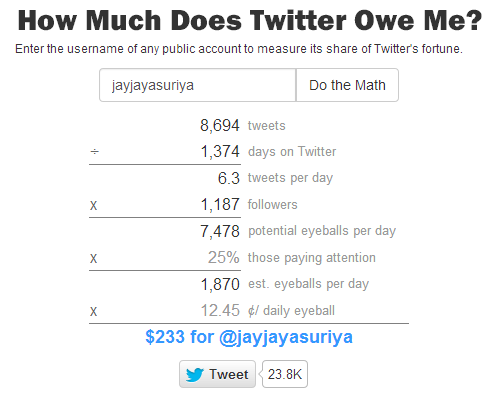 How Much Does Twitter Owe Me? Want to know if your Twitter feed produces enough value to retire? Enter your username to find out? Enter the username of any public account to measure its share of Twitter's fortune. Not enough to retire, huh? Don’t despair, even Barack Obama is getting his clock cleaned online. The leader of the free world is owed $5,160,650, but he’s a small-timer compared with 19-year-old pop star Justin Bieber, who is due $20,916,384 thanks to his nonstop tweeting and devoted following. To see how we came up with those numbers, check the fine print. Of course, the largest hole in this estimate is that the value of Twitter reflects not its current user base but its potential to grow. So go ahead and give back about half of your earnings — if you’re feeling honest.